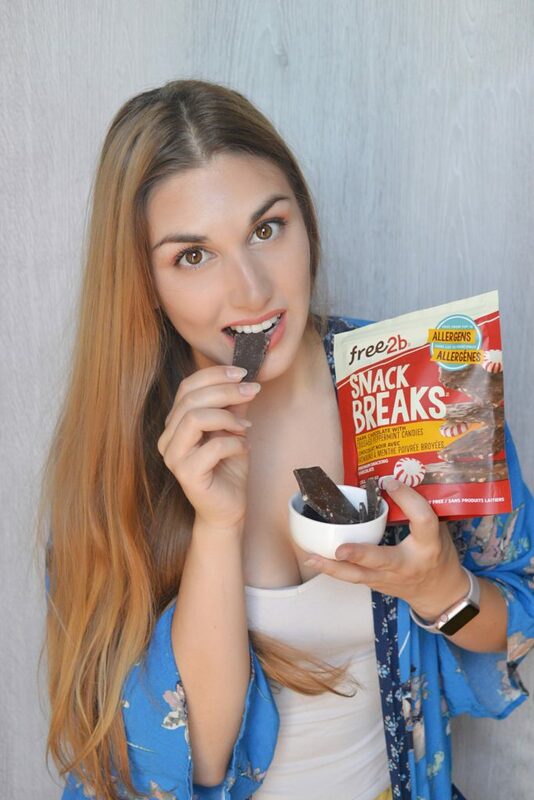 Although this post is sponsored by Free2b and these products were given to me to sample I want to advise you that these thoughts and opinions are all my own. 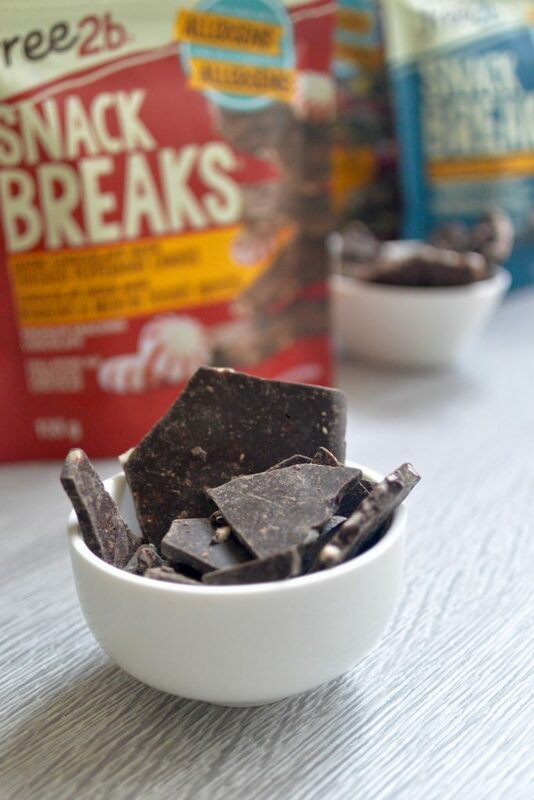 If the title wasn’t enough to persuade you to try this awesome new chocolate snack medley I know exactly how to persuade you. I am so hooked on this chocolate you have NO IDEA! I find being vegan if I were to be craving chocolate my only choice unless I find myself at a specialty store would be to find the strongest of dark chocolates the 99% ones because a lot of the chocolate products have some form of animal product in it… and it’s not always just dairy… also now there are so many fillers and additives that a lot of people are allergic or intolerant. Like my mom she is completely intolerant to gluten so much so that she breaks out in hives. 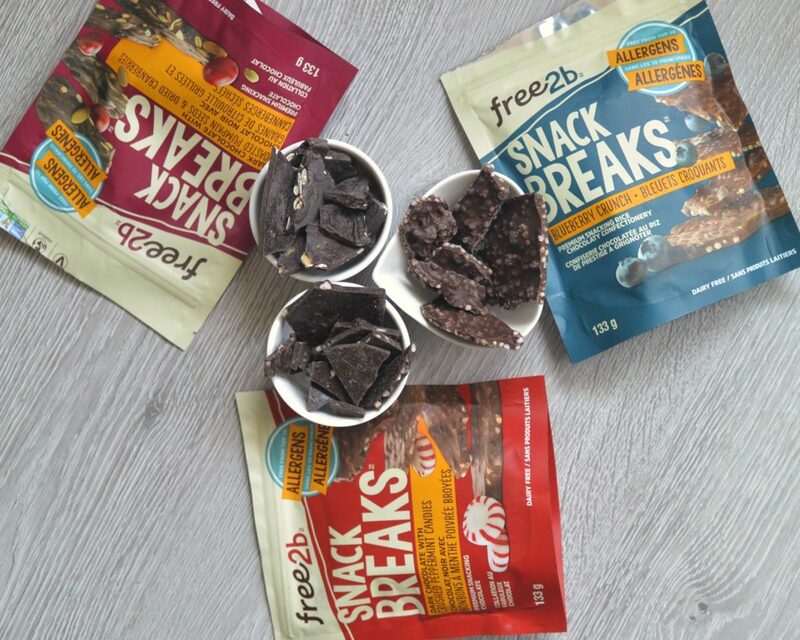 This chocolate heaven known as Free2b Snack Breaks are now available at Pharmaprix in Quebec and Shoppers Drugmart all over Canada. 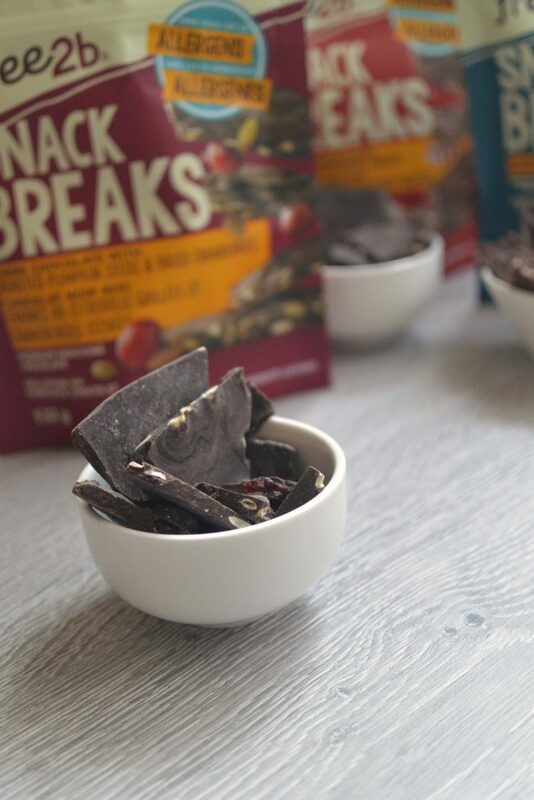 They come in three super yummy flavours and are free from the top 10 allergens! What does this mean for you? Well it means your children can bring these yummy snacks to school. You can offer it with ease at work to your colleagues and you can enjoy it in any of your favourite recipes without worrying that someone will have a nasty reaction to it! All three of these tasty snacks are great but if I have to choose which one is my go to snack. 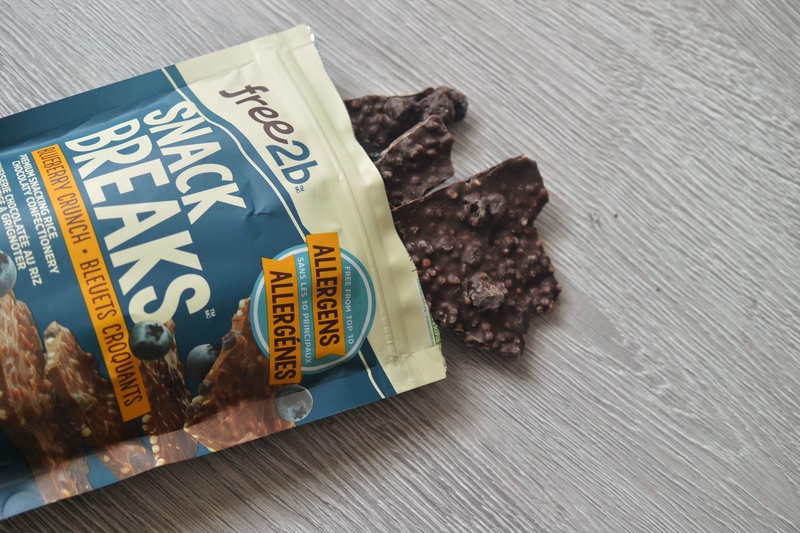 I would have to choose Free2b Snack Breaks Blueberry Crunch! I am a sucker for blueberries and absolutely love that this has an added crunch factor. Also it really reminds me of a chocolate bar! My second favourite is the dark chocolate roasted pumpkin seeds and cranberries. I love it because it has an added element of saltiness. It would really satisfy that 3pm snack craving at the office. Or it would really elevate your breakfast oatmeal!! Finally although I am choosing the dark chocolate with crushed peppermint candies last. It is very good and I would still buy this at the store. But I am still not in the Christmas mindset. Peppermint chocolate brings me right to December with mittens and snow. This chocolate however will work wonders for my gluten free chocolate chip peppermint cookies. I will be sure to post that receipt with this chocolate in the coming months! All in all I am so happy to have been able to discover this brand! I actually cannot wait to try the Suncups which are made with sunflower seeds and the Mint cups. Both are going to be game changers once they hit the shelfs here in Canada! Have you tried any of these yet? Which one would you love to have? 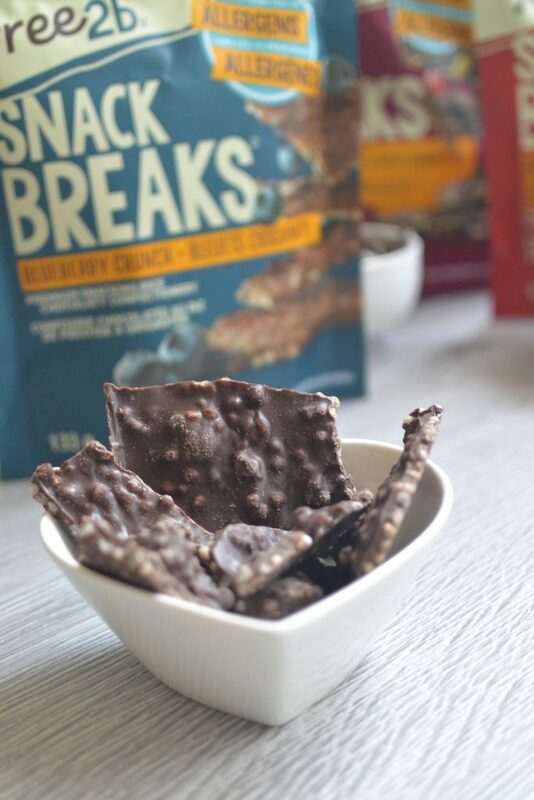 Is there a recipe of yours that you would easily incorporate one of these chocolate snack breaks? Oh this sounds so tasty and healthy. I would love to try this. Thanks for sharing! These look great. I recently found out I am allergic to quite a few items so I will have to check these out! That’s so cool. I struggled with some allergies to what was in chocolate when I was a child. They seemed to have subsided but it’s good to know that they are making chocolate like this. It does look delicious. This is like a dream come true for vegans and others who can not enjoy chocolates due to their allergies. Sounds & Looks delicious!! I love the sound of a snack that’s both healthy and tasty. Gotta look into these. This is such a cool product for vegans and food allergy sufferers. I don’t do a lot of dairy or animal products so this is perfect for me! I am very fortunate that I can eat pretty much any food, and chocolate is something I love. My husband, however, can only do dairy a small amount so this is something I am going to introduce him to! 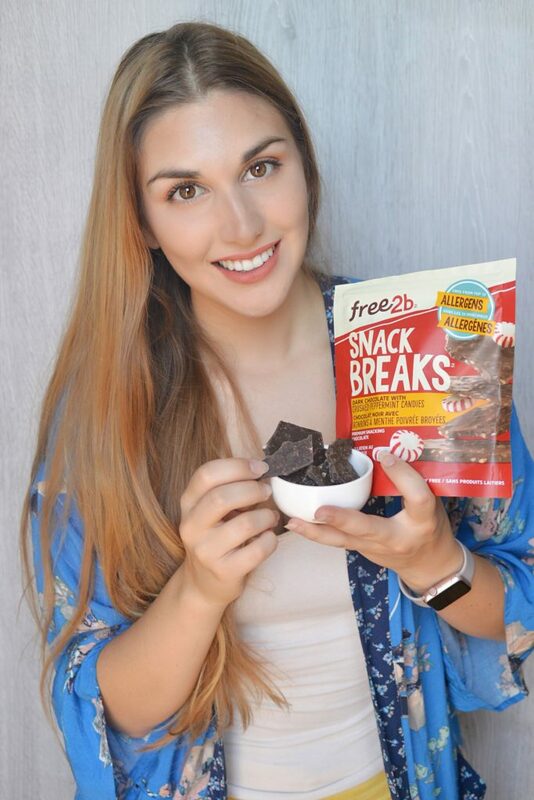 Aside from the fact that I love chocolate…I like the idea of an allergen-free version! I had no idea this existed until now. Thanks! Aw a product I can’t get in the states! The peppermint chunks one is so up my alley! It is so hard to find vegan friendly chocolate, I am always on the hunt for friends! YUM!!! These sound fantastic. I’m a huge chocolate addict, so any of the three sound good to me. The one with the pumpkin seeds sounds especially tasty. I’ll have to check and see where I can find them around me. Great review!